Finance Minister Bill English is under fire for backing a losing horse while keeping the relevant ministry and the Treasury in the dark and side-stepping normal Government processes. Documents obtained by the Herald show that after meeting Pacific leaders in Auckland, he decided to grant a little-known private company, the Pacific Economic Development Agency (Peda), $4.8 million for Pacific youth programmes. When his office informed the Treasury in March, officials asked the Ministry of Pacific Island Affairs for information, but no one at the ministry knew of the initiative. When ministry officials told the Treasury they know nothing, a Treasury analyst responded: "We are even more in the dark on this one - there are no Cabinet papers or anything else ... maybe worth asking your minister's office." 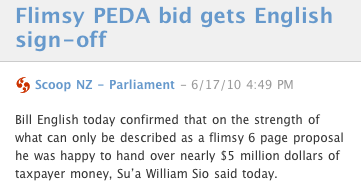 ...Pacific Island broadcaster Efeso Collins lost his job at Radio 531pi for criticising this shonky, shonky, shonky PEDA deal and I blogged a letter of complaint to the owner, Pere Maitai last June, who of course just happens to be the brother of the man running PEDA. How can a 6 page report get almost $5 million dollars? The man at the centre of a political storm over funding for a Pacific employment scheme says there is no truth to rumours that he has National Party links. JR Pereira is the sole shareholder in a company called Pacific Economic Development Agency Ltd, which was allocated $1 million a year for the next four years in last month's Budget for "Pacific economic development programmes in Auckland". Finance Minister Bill English has come under fire in Parliament for approving the deal after meeting Mr Pereira and his associates without holding a public tender. ...it is clear that politics and links to the National Party was what this shonky deal was all about. Remember during the election National's little PR triumph of having Michael Jones and Inga Tuigamala turn up at a factory in South Auckland with John Key to tell the workers they didn't want to work in factories anymore but wanted to own the factories? Yeah well, turns out Inga Tuigamala is on the Pacific Island Chamber of Commerce alongside Ulu Aiono and JR Pereira who structured the PEDA deal. 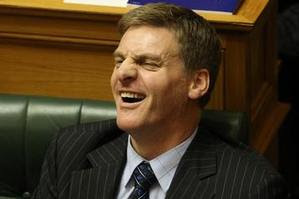 Let's just put that into perspective, Bill English tried to hand over nearly $5million to a private company without holding a public tender while associates of the company punted for National in the election. At what point does one call this a taxpayer funded bribe? New Zealand's youth unemployment rate has surged to nearly 20 per cent – one of the highest levels in almost 20 years. Organisation for Economic Co-operation and Development (OECD) figures for the September quarter last year showed 19.4 per cent of Kiwis aged between 15 and 24 were unemployed – the 15th-highest rate of 36 OECD countries. ...we need new and better ideas to cope with the damage we know deep recessions cause our communities, but to attempt to blow nearly $5million on untested groups who had punted for National in the election seems ugly. Very ugly. It's no surprise that most people wouldn't have heard about the PEDA scandal, as at the time, the mainstream media were too busy chasing Chris Carter down stairs to answer questions about buying his boyfriend flowers. Hilarious stuff, Gay MP buying his boyfriend flowers was FAR MORE IMPORTANT to the political mainstream media than nearly $5million in a shonky deal that smells more and more like a political bribe. Fa'amatuainu Tino Pereira is chair of the trust which owns Radio 531 pi and is the brother of PEDA LTD owner JR Pereira. Bill English needs to be shown the door back to Dipton over this dodgy deal. Efeso Collins should get into politics and bumrush Sam 'loves to linger' Lotu Iiga out of parliament. Sam 'loves to linger' seems to have come out of this unscathed but i bet there's a story in setting up the English/PEDA meetings there to be told that has him at the very forefront. And while we're at it, let's put the ol' warhorse Te Heu Heu out to pasture. Shes even more incompetent a Minister for PI affairs than the inanely smiling Winnie Laban was.